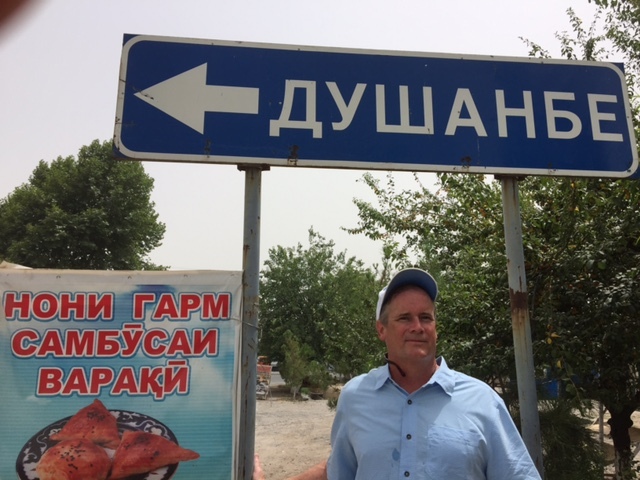 Population: 9 million people live inTajikistan (as of 2016) and the capital is Dushanbe. The snowy mountains of Tajikistan is where Russian soldiers claimed to have seen the mythological Yeti creature. The primary religion is Sunni; almost the entire population is Muslim even though the country has established religious freedom. Tajikistan’s top exports are raw aluminum, gold, raw cotton, lead ore, and zinc ore. In Dushanbe, visitors interesting in a mix of city life and nature should visit the Rudaki Park, a beautiful and relaxing park with modern architecture and stellar views of the city. Another quaint place to visit is the Noor Art Gallery, a little hidden gem filled with artworks and hand-made souvenirs from local artists. 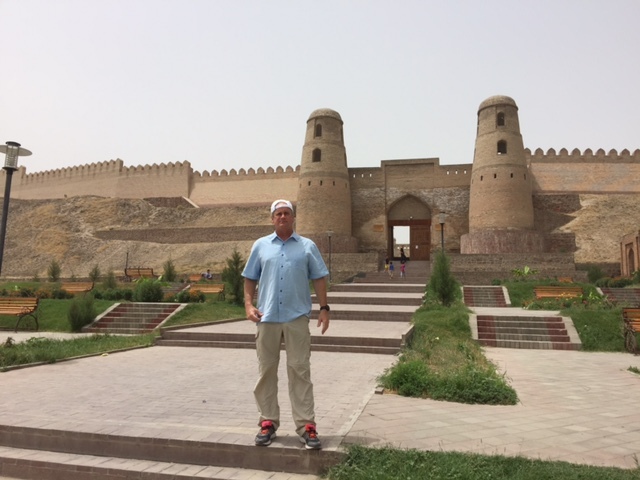 A very quick visit for music lovers is the Gurminj Museum of Music Instrumentals, where travelers can see a lot of local instruments as well as other instruments commonly found across central Asia. To get a glimpse of Tajikistan’s beautiful landscape, visit Lake Alexander in Iskanderkul. It is a turquoise-colored lake surrounded by rolling hills and magnificent mountains. Visitors can rent a room to stay nearby the lake and enjoy going on hikes through the area. An absolute paradise to visit is the Fann Mountains, showing an incredible contrast between lush forested area and foggy, snow-capped mountains. Hikers will enjoy amazing hikes in this area. Hotel(s) I Chose: There is one good hotel in Dushanbe, the Sheraton! 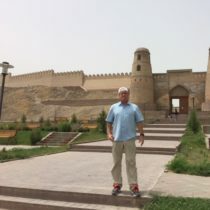 To get from Turkmenistan to Tajikistan I had to fly to Dubai, endure an 6 hour layover and then fly 3 hours to Dushanbe. Tajikistan is the smallest of the “Stans” in terms of population and definitely the poorest. 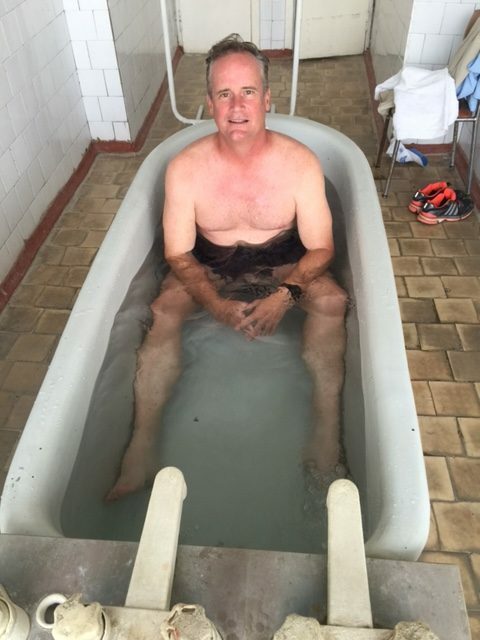 This country has recovered little since its Soviet occupation. It’s uncanny how poorly the Soviets built things. After traveling through the world I am always amazed and saddened by the lack of creativity of Soviet-era architecture. In contrast to other masterpieces being built in Europe at the time, it’s clear the USSR were strict utilitarians. I’m reminded that system failed miserably for several key reasons: the government cannot effectively be the sole caretakers of its citizens, providing jobs, food, health care, products and services, education, etc… I fear the US is headed in this direction, and have seen the disastrous effects of socialists’ communist theology and practices. 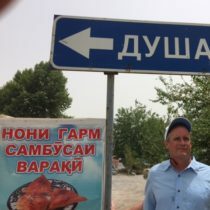 Tajiki stan is a stark contrast to its neighbors Azerbaijan and Armenia. Its noisy streets are crowded with old beat up cars imported from Europe, there for their last hurrah. Actually, I take that back, the Tajiks import old Mercedes from Europe, use them, and then sell them to Afghanis (their southern neighbors) where they will die. There is one good hotel in Dushanbe, the Sheraton, and little else there looks up to Western standards. The government has built a half dozen new parks and monuments, including the world’s largest flagpole—very gaudy. But they built these things with money that should have been spent on roads. 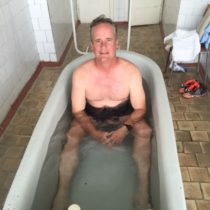 We went to the Olbi Gan Sanitarium, just outside of Dushanbe and I had a soak. Also, took a jog with a boy transporting hay by donkey. Overall, not a place where I’d likely return, but the people couldn’t have been nicer or more hospitable, wish I’d had time to visit the Panin section in the east. -How do you know if a Tajik woman is married or not? Most women don’t wear rings so you can tell by her eyebrows. Married women pluck their eyebrows, unmarried women do not. -Tajik shares boards with Afghanistan and used to be one of the world’s biggest markets for opium smuggled across the border. Little English is spoken here. At the airport, I was asked by airport security to show all currency that I had in my possession. They flipped through any 50$ and 100$ notes (I was only carrying about $500 cash) and after seeing it they asked if I would share some of it with them. That was definitely a first! -cutting grass with the locals and military stopping me—it’s all about control in this country!